According to the National Institutes of Health (NIH), falls are the leading cause of death from injury among older adults. Thom Disch has a passion for this topic and has been compiling statistics and stories related to this healthcare crisis for over a decade. Thom owns HandiProducts, a web-based business that showcases the dozens of products that he has developed specifically for preventing slips and falls. He also wrote “Stop the Slip,” which is packed with practical tips. The Candid Caregiver also has as strong interest in this topic. My first care recipient, Joe, died shortly after breaking a hip, and my parents suffered from the results of life-altering falls, as well. These personal experiences led me to Thom, and an email interview focused on how at least a portion of slips and falls can be avoided. The Candid Caregiver: Thom, I know that you've developed many safety products for the aging population; how did you first become interested in this topic? Thom Disch: Like many people, I didn’t pay any attention to falls and fall injuries until the problem hit close to home. It was the middle of winter in Chicago and an elderly family member slipped on our back porch. Luckily she didn’t fall, but when that happened we realized that our porch represented a huge risk and it was a recurring hazard for everyone in our family. I then began to look for a solution to this problem. I searched in hardware stores and online. I talked to a local handyman. I even talked with the pharmacist at our local Walgreens, thinking he might have dealt with this type of problem for some of his elderly clients. Everyone agreed this was a big problem but that there wasn’t a product in the market to fix it. In my search, I did find things like sandpaper tape, but that couldn’t be applied in winter and it was clear that this would not last very long. I also came across a non-slip additive (a sand sort of product) that could be mixed into paint, but once again this could not be applied in winter and the amount of non-slip traction was going to be minimal. 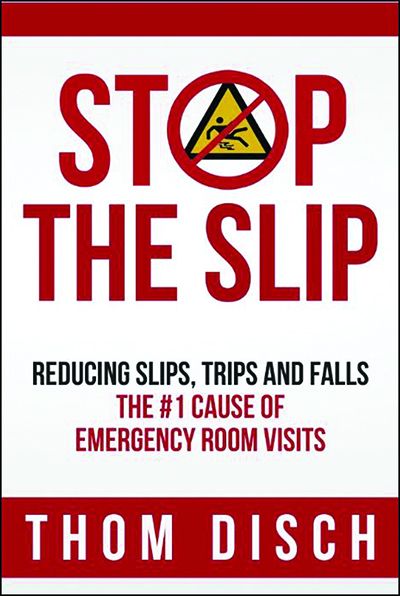 Falls are the number-one cause of emergency room visits every year, representing more than 9 million visits annually. Falls are the 13th leading cause of death in the United States. 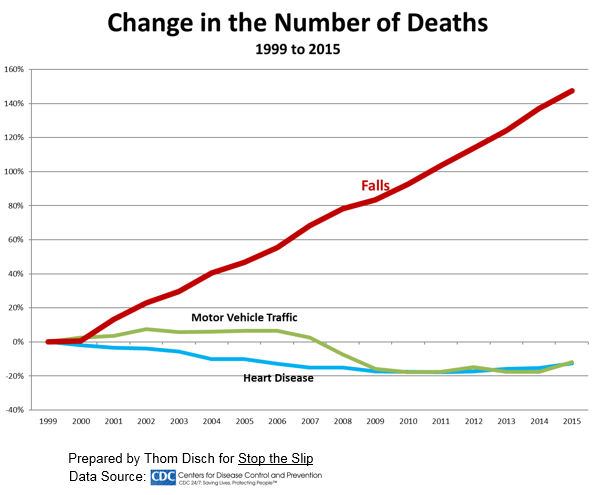 During the last 15 years, deaths caused by auto accidents and heart disease have declined by more than 10 percent, but deaths from falls have increase by 150 percent. The graph below illustrates these changes. As we got more and more into the fall-injury prevention market we found that everyone has a personal story about falls and fall injuries. This ultimately was why I wrote the book, “Stop the Slip.” I wanted to help everyone know that this is a chronic but preventable problem in the United States. TCC: I’m assuming that winter is the most dangerous time of the year for senior falls, but I may be wrong. Could you tell us more about seasonal issues? TD: I’m very cautious when I talk about seasonality and falls. Yes, winter time is a time of greater risk for fall injuries but it is not as significant as you might think. I don’t want people to become complacent during the other times of the year. One of the things that came out of the research for the book was that falls are very complex and they have many different causes. Winter, snow and ice particularly, are definite contributors to the risk, but there are so many factors contributing to falls that winter does not create as much of a seasonal effect as we might expect. TCC: Even if people just go out for medical appointments, they nearly always have to go out in the winter. Could you provide us with tips for senior safety when they must be out on ice and snow? TD: Of course. Some of these will seem self-evident, but most fall prevention can seem that way until something bad happens. Watch for slippery patches. This may seem obvious but just when you think you’ve avoided all risky areas and your attention goes elsewhere, that’s when an accident will happen. Keep your center of balance centered over your feet. This may be more difficult during winter because, with cold weather, we often want to hurry to get out of the cold and back into the warm. This leads to my last suggestion. Put an extra layer on rather than rush to get out of the cold.